The past 10 days have seen an up and down weather pattern in the Mid-Atlantic- A few cool, crisp days followed with hot, dry then hot, humid days. Dry conditions have prevailed until today, allowing some aggressive cultivation to take place in conjunction with the wrap up of soccer league season and in preparation for summer club lacrosse season. 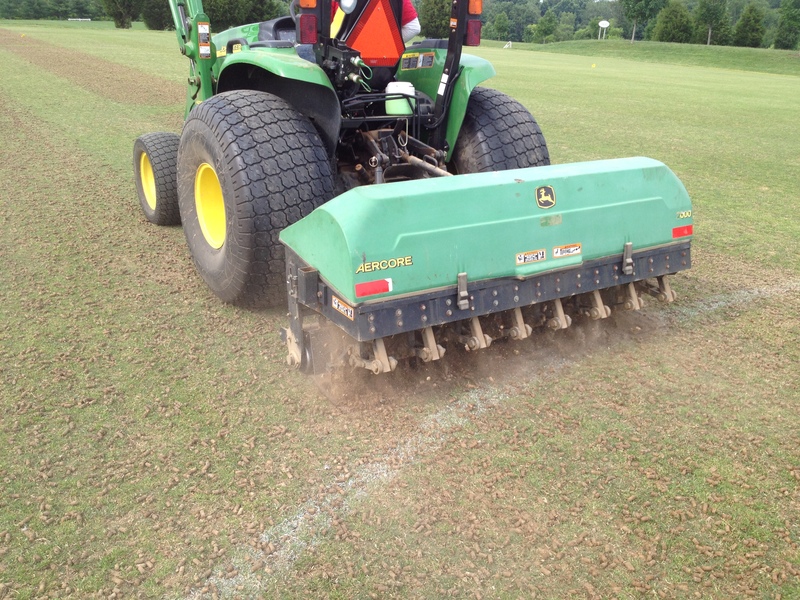 On cool season pitches, aeration pass number 6 took place with deep tine aeration at 8″ w/ an aggressive 15 degree kick, followed with pass number 7 w/ 3/4″ coring tines on 2×2 spacing. With the combination, deep compaction relief took place along with air venting and thatch reduction in the top organic layer… both much needed following the heavy traffic of May and entering the summer stress period. 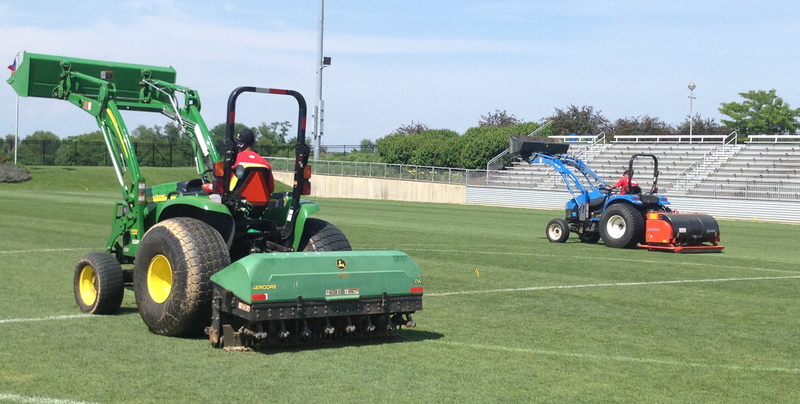 All aeration techniques will continue, just not as aggressively though into the heat…. In reference to thatch reduction from core aeration, following the 1st sweeping of cores from the field we brushed the fields with a heavy brush to stand the grass plants back upright and fluff up any remaining cores. Around Europe, brushing was common.. so I wanted to add it to our program immediately. I assumed that the main benefit would be standing up the grass for better health and mowing. Well I was right on that part, but the biggest immediate difference was the remaining thatch on the very top of the field that was fluffed up. It was staggering!! Piles of thatch were everywhere. Certainly we expect to bring up some, but had no idea that it would be the amount it was. Especially in a lighter growing period under growth regulation, following heavy traffic, and when we have mowed very little as we raise the height up a 1/4″ to 1 1/4″ If that amount comes up during light growth, I can only imagine the amount that will arise during aggressive growth. 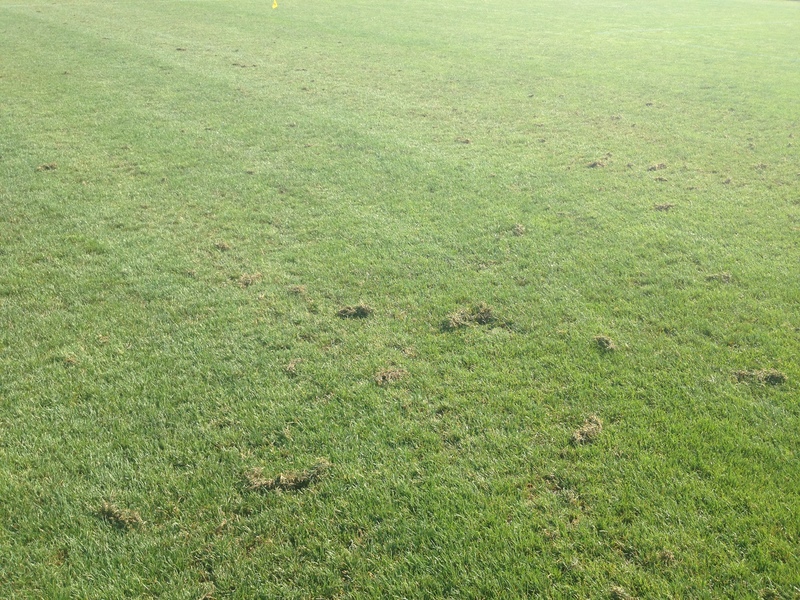 As mentioned, brushing was a common practice around pitches in Europe, as it is in golf course management. But in sports field management, its not something that takes place a lot. After the observations of our 1st experience with it… it will become a weekly practice followed with mowing with baskets for collection. I immediately am looking into tine harrows for additional fluffing and am sharpening the verticut blades as well… We think our program is aggressive enough- but yet again we are wrong! 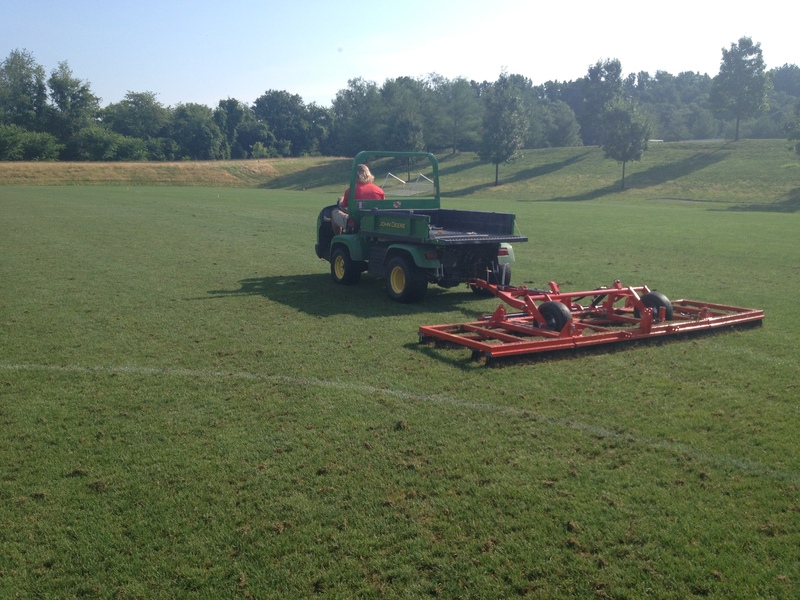 This entry was posted in Global Exploration, Photos, Sports Fields, Turfgrass Growth by GrowingGreenGrass. Bookmark the permalink.